A Historical and Technical Study of Jean-Claude Pressac's "Criminal Traces" and Robert Jan van Pelt's "Convergence of Evidence"
In 1993 Jewish theologian Deborah Lipstadt called British historian David Irving a “Holocaust denier.” Irving sued her for libel in return. Subsequently a court case unfolded in England which attracted the attention of the world’s mass media in 2000. The sharpest weapon in Lipstadt’s defense arsenal was Jewish art historian Robert Jan Van Pelt, who presented an expert report claiming to refute revisionist assertions about Auschwitz. Because Irving had neither the support by any expert witnesses nor was he himself an expert on the Holocaust, he inevitable lost the case. Robert van Pelt was therefore praised as the defeater of revisionism. 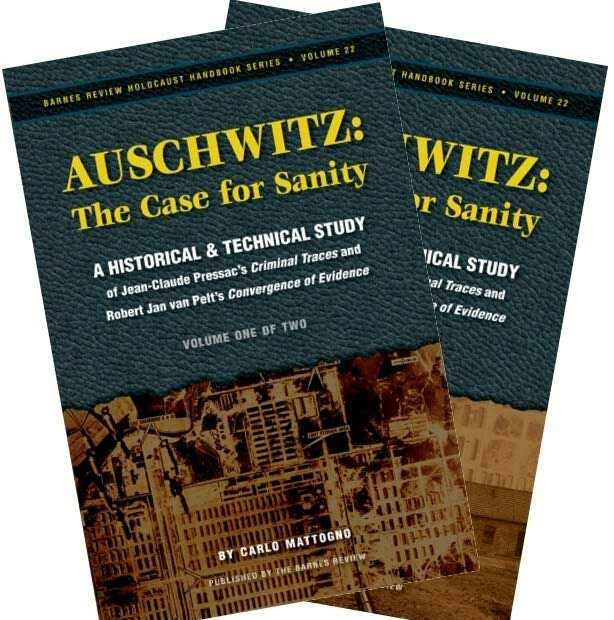 When he published his revised expert report in his book The Case for Auschwitz in 2002, he even advanced to the foremost expert on Auschwitz in the public’s eyes. Mattogno’s Auschwitz: the Case for Sanity is the revisionist response to Robert van Pelt. Its first revelation is that van Pelt has committed plagiarism: he plundered and basically regurgitated the research results published in 1989 and 1993 by French researcher Jean-Claude Pressac – yet without naming his source even once. On more than 700 pages, Mattogno thoroughly scrutinizes van Pelt’s contorted assertions by juxtaposing them to material and documentary facts. Carlo Mattogno, Auschwitz: The Case for Sanity. A Historical and Technical Study of Jean-Claude Pressac's "Criminal Traces" and Robert Jan van Pelt's "Convergence of Evidence"
2 Vols., 756 pp. total (Vol. I: 366 pp. ; Vol. II: 390 pp.) pb., 6”×9”, b/w ill., glossary, bibl., index. Sold as a set only.